For many parents the development of their toddler's vocabulary is a much anticipated event. It is one more step down the road to better communication. The once bawling baby can become a talkative toddler able to share some of the amazing thoughts that constantly fill the mind of it's inquisitive brain. A toddler with an extensive vocabulary is almost a parents dream come true. With a vast array of words under it's belt the average toddler opens up a whole new world of communication and experiences. As the toddler learns how to express themselves with their new found words parents gain a greater insight on how to interact with their child. According to general consensus the average eighteen month old can speak between five to ten words. The comprehension though is much higher at 50-100 words. 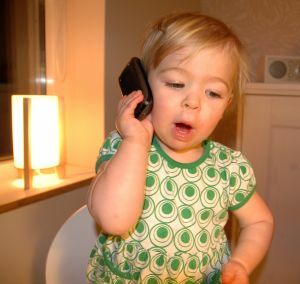 By the age of two years a toddlers vocabulary has doubled in size and has the possibility to increase by ten every day. By the end of the toddler stage a babbling youngster can have the command of around 800 words and understand at least a further 400 more. So how is it possible to help your child's vocabulary reach it's full potential? The easiest way is to talk to them and start early. From the moment they are born, and perhaps even before, babies need to be spoken to. While you may not think that your new born is really interested in the colour of the sky or any of the other words you may say to them, the sound of a loving parent's voice can provide endless comfort in the strange new world that babies are confronted with. This constant conversation is also setting the foundations for open lines of communication later in life as well as familiarising the infant with words and sounds. Within months your child will begin use their vocal cords in ways other than crying and before long simple constant sounds such as goo, gaa, mmm, ta, daa etc can be identified. The next stage sees these sounds progress to small words, like mum, ta, dad etc. Generally somewhere between 12 – 18 months children begin to mimic words as the vocabulary sets up for one of it's quickest increases. By continually engaging your toddler in conversation you are expanding their vocabulary and encouraging a thirst for knowledge. Pointing out your surroundings increase observation skills and provides words for your child to become accustomed to. It also creates a sense of familiarity which in turns sets an ideal learning environment. My daughter is 18-months-old and we are experiencing exactly what you are talking about. It's a thrilling development. I can't wait for her to talk in sentences. It's so amazing to be able to communicate with each other! !